DAN AND MARILYN SCHMIDT had just arrived for the July Fourth holiday weekend at a west central Minnesota lake when they got the phone call from their daughter, Heather Rokeh. She was calling from Marshall with news that a storm had swept through town. It was late Friday afternoon, July 1. And so Heather’s sister, Amy St. Pierre, and Amy’s husband and daughter went to the farm, surveyed the damage, then called the Schmidts. The couple returned that night to inspect their Wood Lake area farm. Every building had been damaged. Hail pounded holes in the siding on the house, where shingles and an antenna were blown off. The door of the Quonset building had been ripped away with part of the board trim speared into the ground. 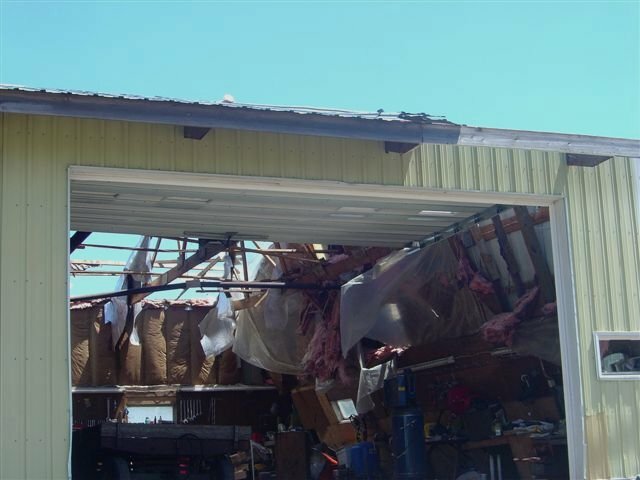 Half the roof was blown off the shop, collapsing an interior wall. That wall is now being held up by two chains and a tractor until items inside can be removed and the building demolished. Another view of the caved-in shop wall. The exposed interior of the shop. Trees were down or uprooted. Branches littered the farmyard. On one of the two houses on the farm site, the garage was pulled away from the house, leaving a visible gap. 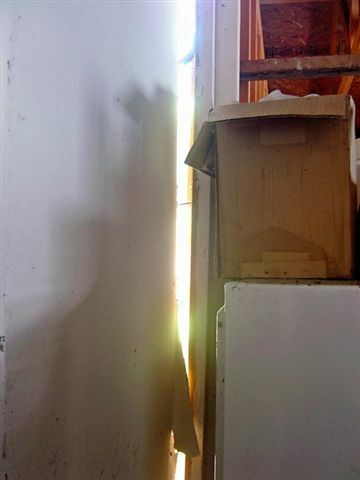 Here you see light shining through the space where an attached garage was separated from the house during Friday's storm. 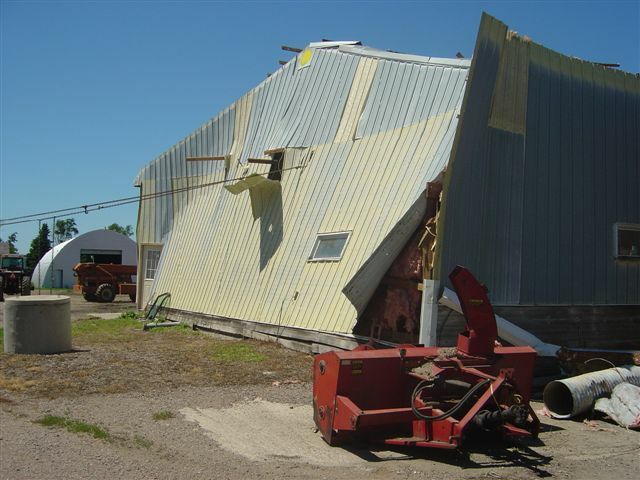 This lean-to, connected to a hog barn, was lifted up, twisted and set back down on top of a stock chopper. 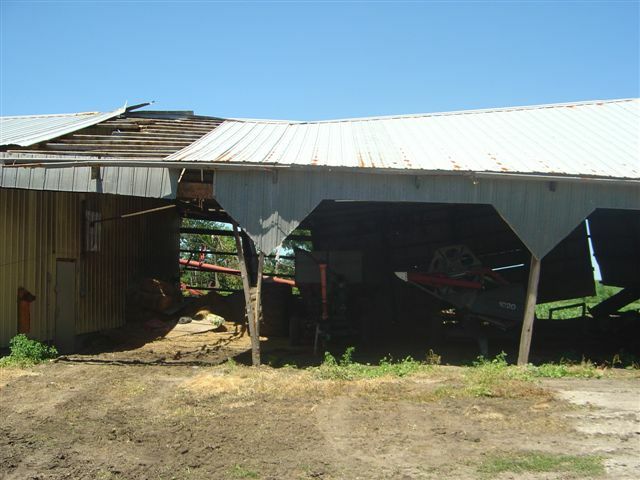 The hog barn was OK, but the lean-to was deemed unsafe and removed on Saturday. This photo shows a portion of the lean-to that was lifted and dropped onto the stock chopper pictured here. 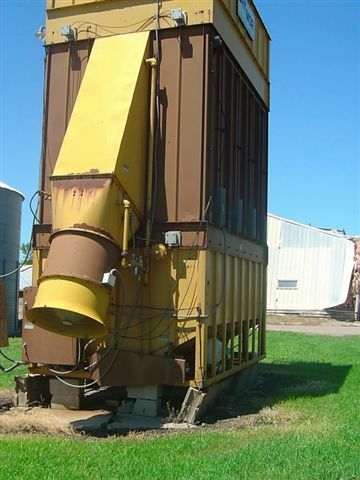 This grain dryer was moved and it is now sitting crooked on its foundation. The cement slab foundation was cracked and cement blocks are now sitting at an angle. 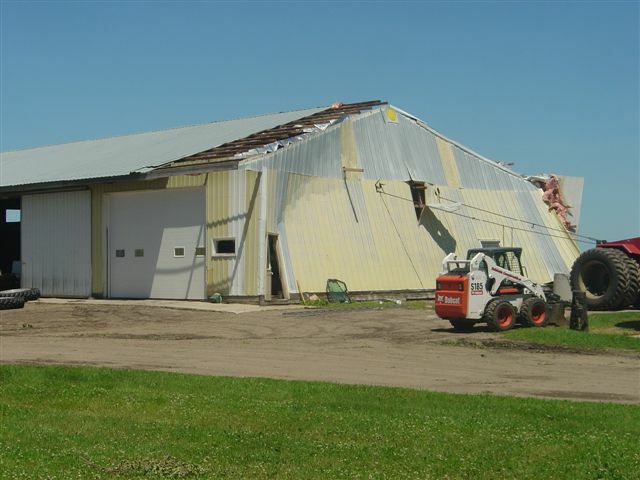 IF YOUR FARM, HOME or community was damaged during the July 1 storm in southwestern Minnesota, I’d like to hear from you. 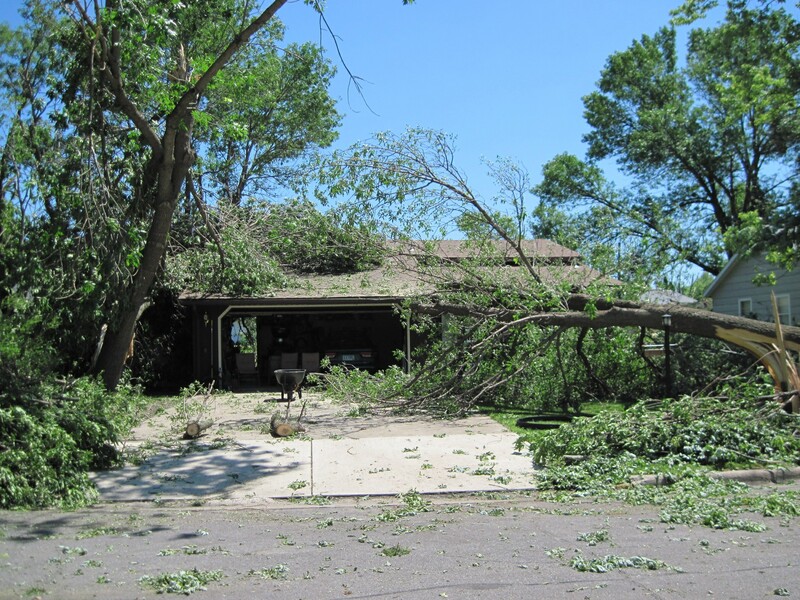 Submit a comment summarizing your storm experience, the damage to your property or town, and progress toward recovery. If you have photos to share, like those above from my cousin Heather, let me know and I’ll be in touch. 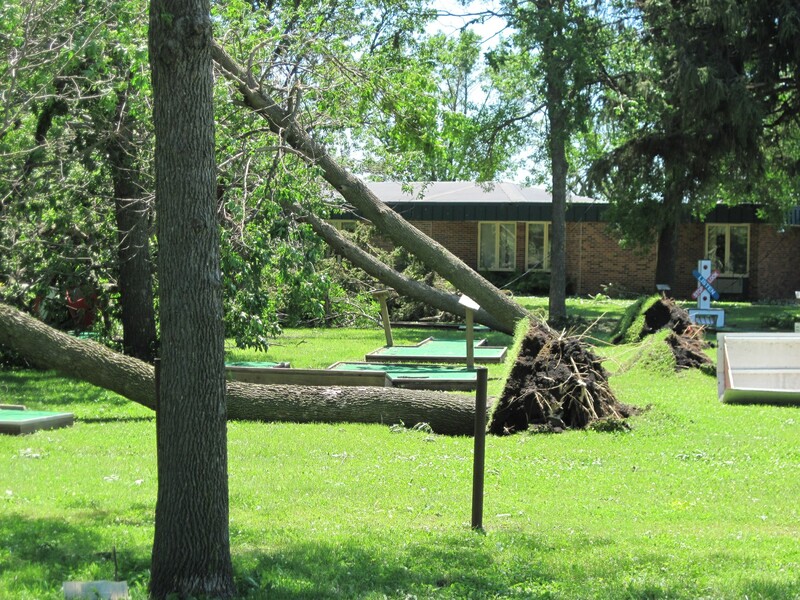 Also check out my previous posts on storm damage in my hometown of Vesta and in neighboring Belview. THREE MONTHS AGO Merlin and Iylene Kletscher closed on the purchase of a foreclosed house along Main Street in Belview. They plan to sell their lake home near New London and move back to Iylene’s hometown, also within 10 miles of Merlin’s hometown of Vesta. My aunt and uncle want to be closer to family and friends and back in a small town like Belview with a population of 375. They chose the Main Street fixer-upper, among other reasons, for all the beautiful trees on the property. 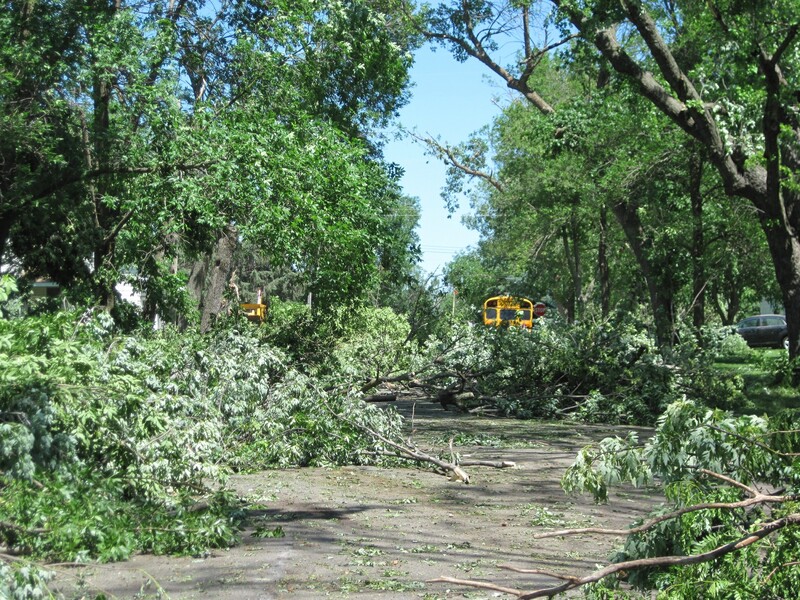 Today most of those trees are gone, toppled in a storm that swept through Belview and a wide-spread area of southwestern Minnesota late Friday afternoon. 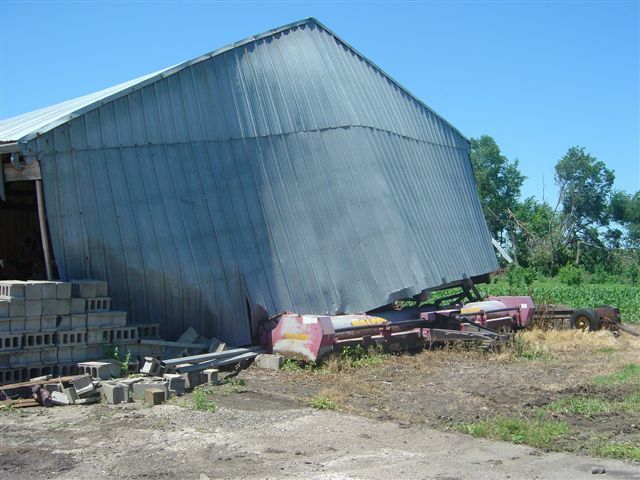 The storm ripped off roofs, took down power lines and trees, smashed grain bins and elevators and more as fierce winds roared across the flat prairie. Merlin and Iylene Kletscher's home on the left, surrounded by downed trees. 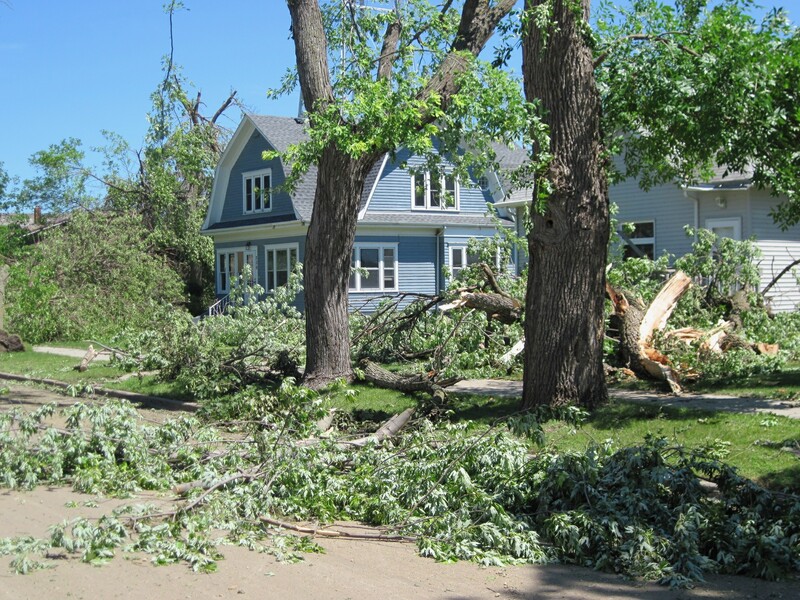 Now Merlin and Iylene, like so many others in this area of Minnesota, are dealing with insurance companies and contractors as they clean up and repair their homes and businesses. “The new chimney we had installed is leaning,” my uncle says. “The new shingles are missing ridge caps. We have broken windows and torn screens, etc.” The couple had just installed new windows in their home and made other major improvements. It seems the city was prepared for a natural disaster such as Friday’s storm. 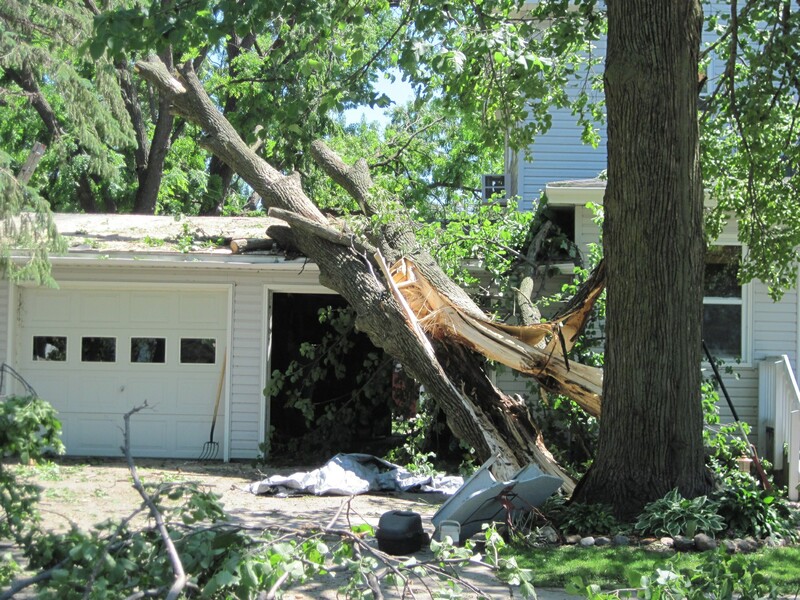 Log onto the city website and you’ll find a “CONSUMER ALERT: SUMMER STORM SEASON” posted by City Clerk Lori Ryer on May 24 encouraging residents to prepare for summer storms. Entering Belview from Sacred Heart at 9 a.m. on July 2. The city of Belview's water department building. Trees blocked the street north of the Belview City Park. Jerry Hagen's house, across the street from Merlin and Iylene's home in a July 2 photo. Residents of Parkview Home, next to the city park, were evacuated Friday night. This photo shows the nursing home and mini golf in the park. The rubber roof of the nursing home was peeled off during the storm. Storm damage at the home of the Rev. Daniel Faugstad family. 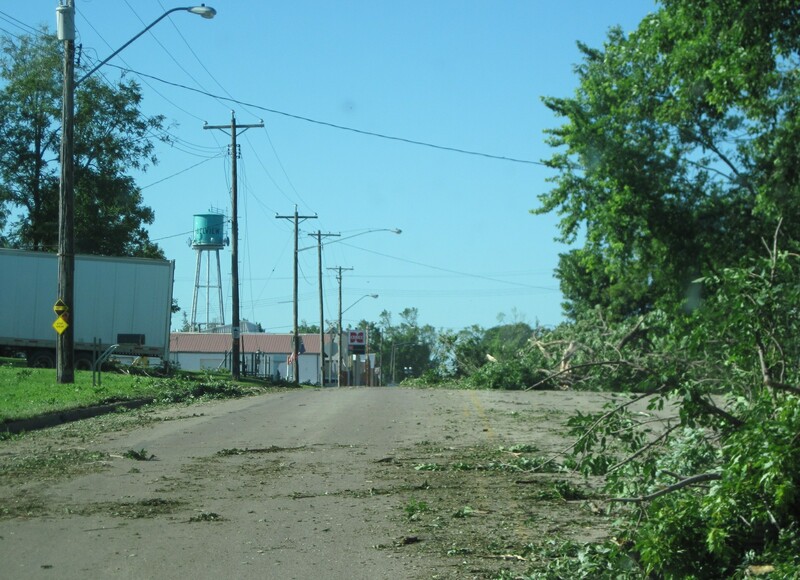 Damage along South Main Street. 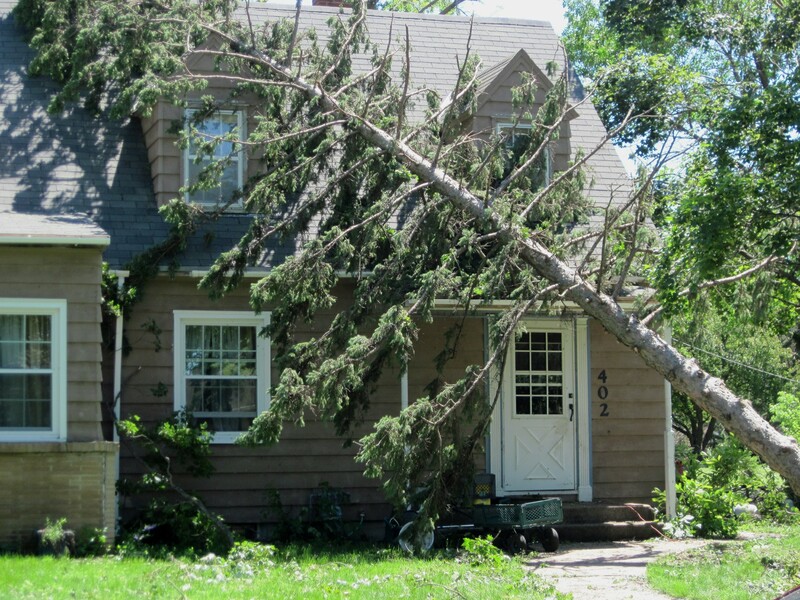 Another tree toppled onto a house. More residential storm damage in Belview. Merlin also reports that a farmer just west of nearby Vesta (my hometown) recorded a high wind speed of 110 mph on his wind velocity meter during the storm. I have not yet confirmed that information. Vesta was also hard hit by the storm. Click here to read that story and view photos of the damage. 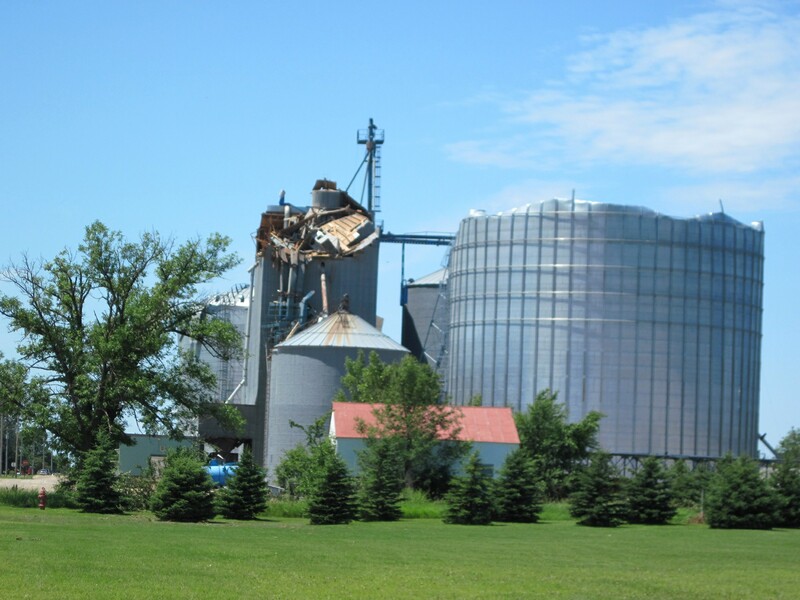 The damaged bins and elevator at Meadowland Farmers Elevator in Vesta. 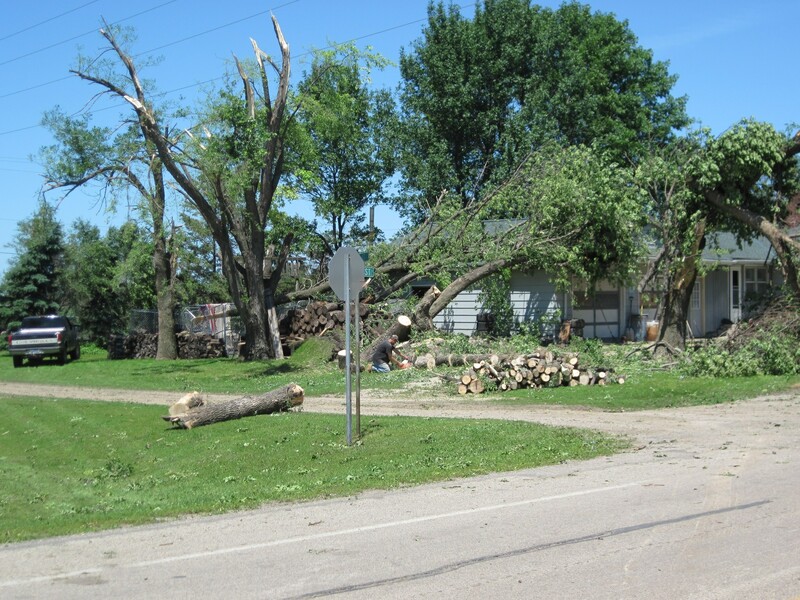 Neighboring Belview and Vesta are only two of the many, many small towns in southwestern Minnesota hit by Friday’s storms. I expect that hundreds of farm places were also ravaged. For the most part, the disaster has not been covered by metro media and that bothers me—a lot. 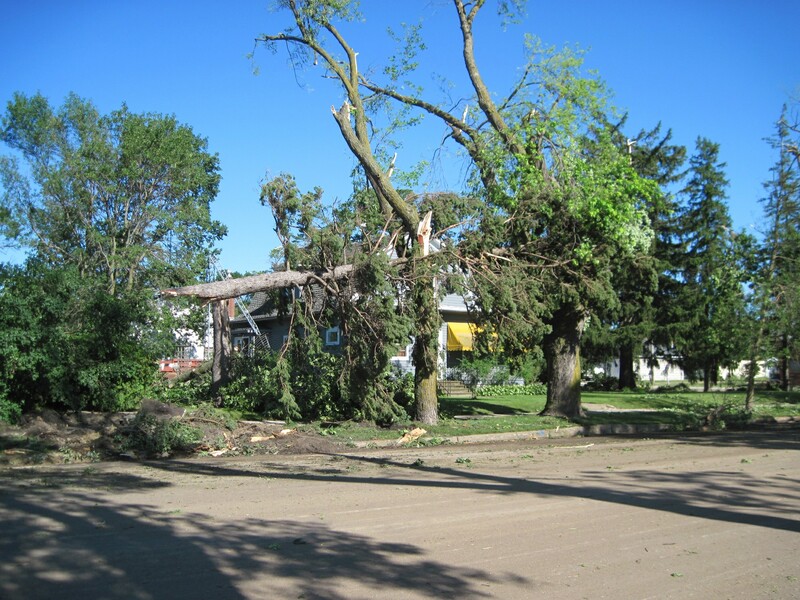 IF YOU LIVE in southwestern Minnesota and were impacted by the storm, please submit a comment telling me about your personal experiences (where were you/did you seek shelter/what was the storm like, etc. 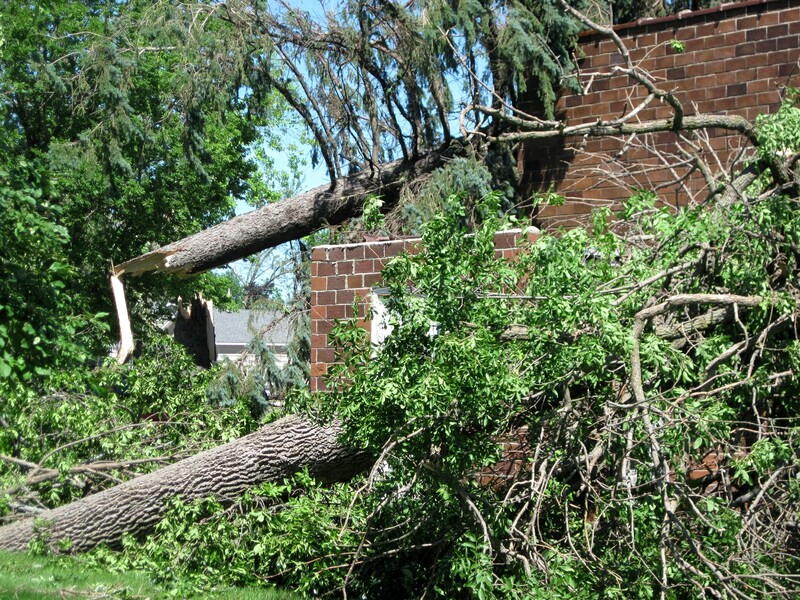 ), damage to your property or town, and recovery progress. I am also looking for photos to publish, so contact me via a comment and I will follow-up by emailing you.